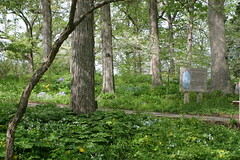 The Shaw Nature Reserve, a division of the Missouri Botanical Garden, encompasses 2,400 acres of natural Ozark Border landscape, with 3.5 miles of Meramec River frontage on both banks and an extraordinary diversity of native plant and animal habitats. Located 35 miles southwest of St. Louis in Gray Summit, Mo., it strives to inspire responsible stewardship of our environment through education, protection and restoration of natural habitats, and public enjoyment of the natural world. Staff work closely with the Missouri Department of Conservation to promote native plants and encourage their use in sustainable and environmentally-friendly gardens and landscapes. The Missouri Botanical Garden founded the Shaw Nature Reserve, formerly known as Shaw Arboretum, in 1925 when coal smoke in St. Louis threatened the living plant collections at the Garden. The orchid collection was moved to the Reserve in 1926, but pollution in the city abated before it was necessary to move the entire plant collection. Conifer groves of the Reserve’s Pinetum area also date back to that time, when evergreens had become difficult to grow in the smoky St. Louis air. The diversity of plant communities and the extensive acreage of the Nature Reserve, combined with the educational resources of the Garden, provide a unique opportunity for outdoor education. The Reserve serves as an outdoor laboratory for the development of innovative outdoor interpretive programs. Education staff, specially-trained volunteers and guest instructors offer workshops and classes for thousands of children and adults each year. 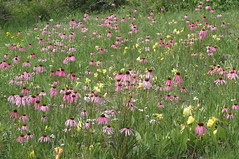 Since 1980, the Reserve has become a focus for native habitat management and restoration, including prescribed burning; correctly-timed field mowing; selective thinning of woodlands; judicious use of herbicides for invasive species control; plant diversity enhancement; and reconstruction of prairies and wetlands. As a result, the Reserve is able to offer 14 miles of hiking trails through an array of Ozark border landscapes, including floodplain forest, dolomite glades, tallgrass prairie, oak-hickory woodlands, savannas and wetlands. 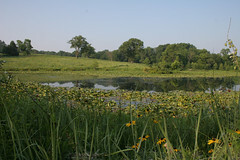 Restoration of these habitats provides the Reserve’s visitors a uniquely varied experience of Missouri’s rich biological heritage. 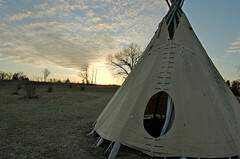 The Reserve also features more conventionally-managed settings in which visitors may enjoy the outdoors. The Pinetum is a 55-acre park-like expanse of meadows containing groves of conifers from around the Northern Hemisphere. 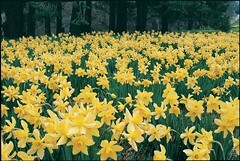 In spring it comes alive with innumerable daffodils and flowering trees. In recent years, as the non-native conifers age and die, native short-leaf pines have been planted and native hardwood trees, grasses and wildflowers have been promoted in the area. The Whitmire Wildflower Garden is a five-acre demonstration garden with paths that meander beneath massive oaks, over water and through beautiful displays of native wildflowers. A home gardening demonstration area provides information and examples of the Midwest’s hardiest and most attractive native wildflowers, shrubs and trees. The Bascom House, an elegant brick home built in 1879 by former Confederate Col. Thomas W.B. Crews, features “People on the Land,” an exhibit made possible by a challenge grant from the Missouri Department of Conservation. This exhibit illustrates the interaction between humans and the land in eastern Missouri over the last 12,000 years and interprets the resulting, complex environmental issues associated with it. The Maritz Trail House, a rustic stone and log picnic pavilion, is a meeting point for many of the Reserve’s hiking trails, providing access to glades, prairies, the Meramec River, and the Shaw Bottomland Forest State Natural Area. The shelter also provides restrooms, a drinking fountain and a comfortable spot for hikers to rest and picnic, in addition to a small classroom. The Dana Brown Overnight Center is a complex of historic buildings (circa 1850), carefully taken down at their original locations and reconstructed at the Reserve. It includes four log lodges and a large post-and-beam Assembly Building. The Center is designed to accommodate a wide variety of groups. When not used by school groups, it is the ideal setting for retreats, workshops and small corporate meetings. The Shaw Nature Reserve is located on Interstate 44 in Gray Summit, Mo., 22 miles west of the I-44/I-270 interchange at exit #253 (two exits west of Allenton/Eureka). Hours of operation are 7 a.m. until sunset daily; Visitor Center, 8 a.m. to 4:30 p.m. on weekdays and 9 a.m. to 5 p.m. on weekends; Bascom House, 10 a.m. to 4 p.m. everyday. The Nature Reserve is open to hikers everyday, but the Visitor Center and Bascom House are closed on some major holidays. Admission is $5 for adults, $3 for seniors (ages 65+) and free for children (ages 12 & under) and Garden members. Contact (636) 451-3512 or visit www.shawnature.org.